Mother Nature was very kind to us in 2018. 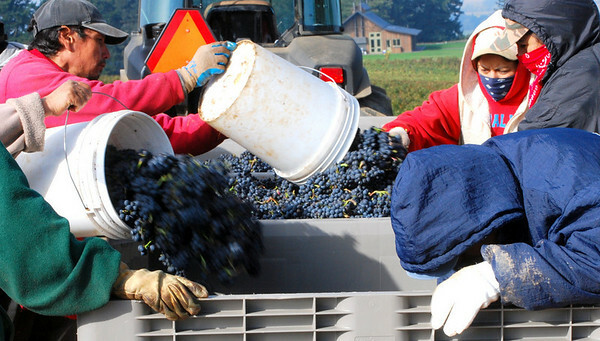 Rain and cool weather are things you expect during harvest in Oregon, but not this year! All during harvest we were given warm, dry weather under beautiful blue skies. This perfect weather meant we could harvest each variety at the ideal moment. There was no pressure from the weather so our pace was almost leisurely compared to a normal vintage. It was a harvest to remember as will the wines! Picking tinta roriz, this is our last vintage of this variety as these vines will be pulled and replanted next year. Picking starts at dawn with the vines still in the shade of the Siskiyou Mountains, which are already brightly illuminated. Banele and Jesus picking malbec as dawn breaks. The Applegate Valley during harvest. In a biodynamic vineyard, the leaves are fully turned color and falling off when it is time to pick the fruit. This is the natural cycle of a vine. Vineyard manager Adan Cortes bundled up against the morning cold as he harvests vermentino. Associate winemaker and biodynamic team leader Nate Wall fills cow horns to make biodynamic preparation 500. They will buried until next spring. Making BD 500 is something you do during harvest in the fall. 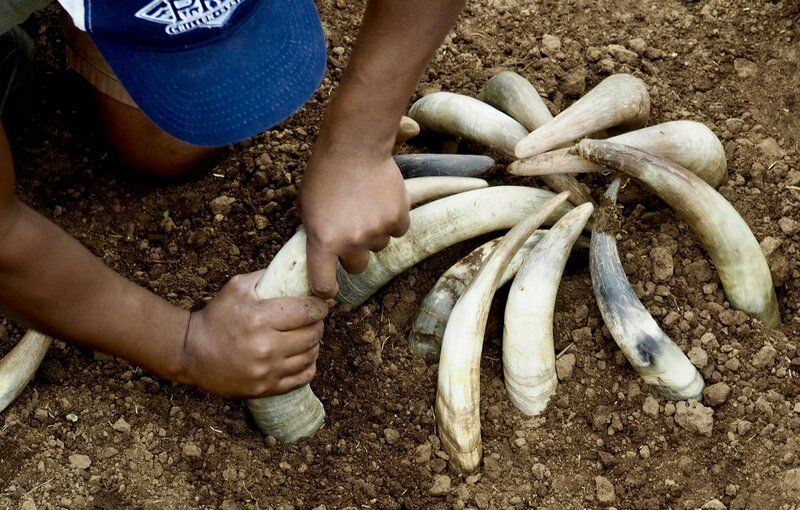 Banele, our harvest intern from South Africa, places the filled cow horns in pit to be buried until next spring. The BD 500 they will produce will be sprayed on our vineyards. Grape pomace, fresh from the press, is added to our compost pile. All the leftovers from harvest are added to our biodynamic compost piles and returned to the vineyard. 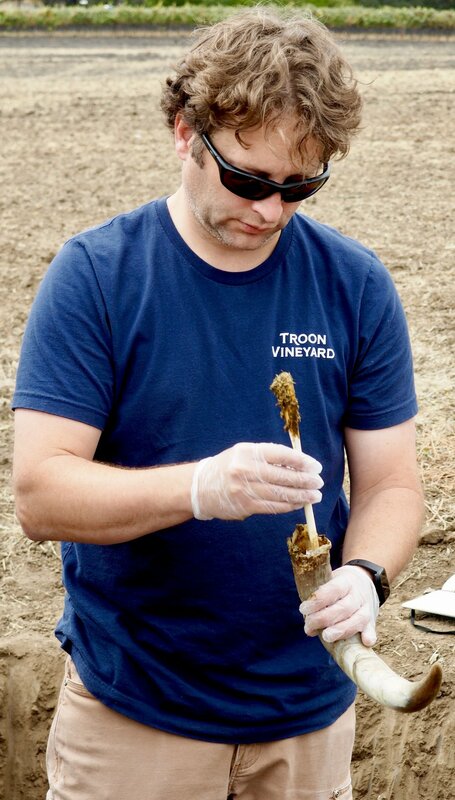 When I first arrived at Troon Vineyard, the then vineyard manager reviewed the previous year’s vineyard applications. Other than the usual nastiness like Roundup, one product immediately grabbed my eye - Venom. I was not familiar with this product, but, with a name like Venom, I did not expect anything good. That’s right, it kills honey bees. All of them. There was no more Venom or anything like that used at Troon from then on. Today, now that we have converted to biodynamic agriculture, we use products with much gentler names and impacts on the environment. For example, now we use products with names like Regalia, an organically certified biofungicide that works by strengthening the plants own defenses rather than poisoning anything and everything whether good or bad. It does not seem to be a coincidence that conventional chemical agricultural products often have scary names as, indeed, they are dangerous to everything - people as well as bees. Humans consider themselves smarter than plants, but we’re not. When it comes to producing grapes, the vine understands more about producing beautiful ripe grapes than we’ll ever know. It is arrogant on our part to believe we can do better. That arrogance has led to the use of chemicals that destroy the vines natural ability to feed and defend itself and to weaker plants addicted to fertilizers and chemicals. A weak plant does not produce the kinds of grapes that produce great wines. The single most important thing for quality wine is a strong, healthy grapevine. Our job as winegrowers is to help the vine do its work, not to do its work for it. When it comes to growing grapes, we are the apprentice and the vine is the master craftsman. This is a good thing to remember in this era of cult wines and winemakers. It is the vine and the soil that create memorable wines, not people. People are quite capable of producing commercially successful beverage wine products, but only vines and vineyards can give you sublime, individual wines. In a well-farmed vineyard with healthy vines and good soils, the winemaker's role is more as a shepherd than artist or technician. If you are not humbled by nature you are not connected to it, don’t understand it and can’t transform that power into wines that are anything other than industrial. Biodynamics finally clicks in your brain when you realize as a farmer you are not a general in charge of a battlefield, but just another cog in the gear that makes nature work. Arrogance and chemical interventions have led to disaster. Farmers who realize their place in nature produce better and healthier foods and wines. This is a mindset that can be achieved by farmers large and small. Now at Troon, instead of destroying honey bees we are building three aviaries with accompanying pollinator habitats. The bees deserve this respect as we are just two of the myriad of intertwined pieces that make a farm a whole. We owe them something for the past sins of our predecessors. It will be an honor to welcome them back home. A winemaker in Bordeaux has a universe of five. In Burgundy a winemaker has one, maybe two varieties that demand their focus. In Beaujolais they live by gamay. In Barolo nebbiolo defines the reputation of a winemaker. In Napa, if you make great cabernet sauvignon no one will much notice what else you do. In the established wine regions of the world, a winemaker’s universe of options is preordained. In no way does this diminish their skills and accomplishments, but it does allow them to focus. To be able to focus is to be efficient and efficiency leads to consistency, which is an essential aspect of mass market success. Yet market success does not often fire the imagination or inspire innovation. They say the pioneers take all the arrows. Welcome to the world of winemaking in one of the world’s emerging fine wine regions. I’m in the Applegate Valley of Southern Oregon, but I believe that winemakers in emerging regions around the world get hit by the same arrows. Winemaking in an emerging wine region requires the courage of your convictions. Planting a new vineyard in a new region is a true leap of faith, but as they say, the greater the risk the greater the reward. But we don’t work in a vacuum. Years of knowledge and science have accumulated from the work of winemakers and viticulturists before us so we don’t have to push blindly forward. There are pioneers in every new region that took a lot of the arrows for all of us. Admittedly, many of these people that first planted vineyards in new regions were learning only by trial and error, but from their failures and successes, we can build a foundation for an exciting new wine region. One such exciting new region is on the Kubli Bench of the Applegate Valley. Applegate Valley is not new as it was established as an AVA in 2000, but there is a growing energy here and we are on the tipping point. The Applegate Valley is now on the edge of breaking out. The varieties that will fuel that breakout are coming from the shores of the Mediterranean and the rugged hills of Southwest France, not from Bordeaux, Burgundy or Napa. The Rhône will have a voice, but the future of the Kubli Bench will be in the tradition of Bandol, Languedoc-Roussillon, Cahors and Madiran. These regions are now, after centuries of winemaking, escaping the shadows of their famous French cousins because of an exciting revolution in winemaking and winegrowing in those regions. We will be joining them in this winemaking revolution. We are now making plans to either graft or replant many sections of our existing vineyards with the varieties that belong here. We’ll be planting more tannat, malbec, marsanne, roussanne and mourvèdre for sure (we already have significant acreage of syrah and vermentino), but varieties like picpoul, petit manseng, carignan, grenache (red and white) and cinsault will also find a home on the Kubli Bench. Because of everything that we’ve learned and the excellent quality of the wines we’ve already made I do not feel planting varieties like these is a leap of faith. We have the courage of our convictions. I like making wines that people drink rather than collect. Wines that are delicious, richly flavored, and affordable that bring pleasure to people lives are as rewarding to make as they are to drink. There is no bottle more exciting than the wine that is open on your table. The Applegate Valley is a perfect place to make these kinds of wines. I have to admit. Making wines like this is fun. This article first appeared in the Dracaena Wines blog series"Pursue Your Passion""the story of one person in the wine industry, as told by them"
It all started with Watergate. How topical is that? That scandal hit just as I started college. Armed with no passion except football at that time in my life I suddenly saw a bigger world and signed on to my college newspaper. I was going to be Woodward and Bernstein. I packed on the history hours eventually spending a semester in Europe "studying" (Nixon resigned during my flight back). While I was graduated as journalist, just four years later I was part of a start up wine importer and distributor. Now instead of reading All the Presidents Men I was immersed in Lichine, Penning-Rowsell and Bespaloff. What happened? On that trip to Europe I was introduced to wine and food. Having grown up in a land were food and drink were eptiomized by Pabst, Manhattans and friday night fish fries the experience was a revelation. A chain reaction was started. This growing transition from news to wine was fueled by my friend Don Clemens, who had landed job with Almaden Imports, who in those days (the late 70s) had a cutting edge portfolio. My mouth still waters today as I remember drinking Chapoutier Tavel with ribs at Don's apartment. There was no going back. In 1978, with zero experience, I talked my way out of journalism and into wine with a new job as the midwest rep of Peartree Imports, whose main brand was the Burgundian négociant Patriarche, but the portfolio was rounded out with a range of spirits guaranteed not to sell in 1978. I hit the books for my first sales calls - work-withs - with the sales team of Union Liquor Company in Chicago. I memorized each vineyard and the precise details of each spirit. On my first day I jumped into the salesman's car and we headed into Chicago's war zone. The main brand of these salesmen was Richard's Wild Irish Rose in pints. We'd get let in the back door of a fortified "liquor store" that consisted of several revolving bulletproof windows where customers would place their cash and, after spinning the window around, would get their pint of Richards. The salesman (there were no women in those days) would get his order for 100 cases of Richards, get paid in cash for the last order, then I had a few minutes to pitch my brands to the owner. I was not very successful. Then the owner would take his shotgun and walk us back to the car so no one would steal the wad of cash we'd just received. Even with this dose of intense realism I was not deterred. This was a very special time for me. It was a great privilege to work with people of such integrity and creativity. They all inspire me to this day. Then my partner wanted out and I did not have the money to buy him out so we were acquired by The Terlato Wine Group. I had a five year contract to stay, but those were some of the darkest years of my life in wine. Instead of integrity I was tossed into the world of simply moving "boxes". When my sentence was up I escaped to Italy for three years and due to the graciousness of extraordinary winemakers like Luca Currado (Vietti), Manuel Marchetti (Marcarini), Tina Colla (Poderi Colla) and Andrea Sottimano in Barbaresco I dug deeper into the spirit of what makes a wine great. Many hours in the cellar and vineyards with them brought me back to the world of wine I loved. Refreshed and inspired I returned the the United States and now have spent almost 15 years divided between the vineyards of Napa and Oregon. During these years I have drawn on the knowledge and inspiration of all of the great winemakers I have known over more than three decades in wine. I will freely admit my winemaking heart now firmly resides in Oregon. There is a fresh spirit here. You just know the best wines are yet to come and I relish being a part of that energy. In the end there is no final satisfaction in winemaking, because there is no such thing as perfection. The concept of a 100 point wine is simply absurd. However, while you may never be totally satisfied with any wine you make, you can be totally satisfied by experience of making them. There is a deep satisfaction at the completion of each vintage, be it great or difficult, that is not only deeply rewarding, but addictive. You have to come back for more. I think we should start flowering in the Applegate Valley next week. Only in agriculture are you reborn every year. It's an iconic episode of Portlandia. Appearing in the very first season, it's a skit that even those that have not seen the show know. When you enter a search for Portlandia Chic... Google auto-fills the link before you even can finish typing. It's the Portlandia chicken episode. A couple in a Portland restaurant become so obsessed with determining just how local the chicken is that they actually leave the restaurant without eating to go to the farm itself. Like most things in Portlandia, as outrageous the skits are, anyone who knows the city understands that there is a bit of reality in each of them. Indeed there are few cities where the restaurants are more obsessed with farm-to-table provenance. And with good reason, the farmers, dairies, fishermen of the Northwest provide exceptional foodstuffs. It's very hard to understand why so many of the best chefs in Portland know every farmer they work with by name - except the farmers that grow wine grapes. In Portland restaurants that would not consider buying an egg from more than a hundred miles away, or use a cheese not from the Northwest, or pork not from Carlton Farms, it’s common to find wine lists dominated by wines from Europe. While working dead center between two world-class wine regions in Oregon and Washington they somehow rationalize buying wines that have to be shipped in containers across the ocean instead of the internationally respected wines made in their own backyard. Not too long ago I walked into a Portland oyster bar to do some serious slurping only to discover that not a single wine-by-the-glass was from the Northwest. The essentially French list was well chosen, but considering they only featured Northwest oysters maybe a local wine or two might have been in order. Perhaps I'm overly sensitive, but I'd think anyone can see the irony here. However, I am sensitive to their pain. It can take a lot of work to find interesting American wines in the wine-by-the-glass price range. But isn’t that the work that a sommelier is paid to do? We're not talking about restaurants in Arkansas or Alaska with no significant local wine industry to draw upon, but a city within a few hours driving distance of important, world-famous wine appellations like the Eola and Dundee Hills, Yamhill-Carlton, Walla Walla and Red Mountain. These are not some upstart appellations, but vineyards that have been researched and worked for decades. These AVAs and many others literally produce wine in any style from almost any variety you could want. - also in any price point. Incredible as it may seem, I constantly meet wine buyers in Portland who've never gotten their shoes dirty in a local vineyard. People that pour over books breaking down every minuscule detail of tiny appellations in Burgundy or Barolo ignore the vineyards that surround them. While most have understandably never been to France or Italy, it is hard to comprehend why they’ve not been to the Dundee Hills or Walla Walla. One thing for sure, you never truly understand a wine region until you’ve walked in its vineyards. You're either a farm-to-table restaurant or you're not. It’s time they got off their butts and buy local wine as well as local food. You want biodynamic we've got it, want commercial plonk, we've got it, these and everything in-between. Cheap, expensive, rare, widely available, no problem we've got them. Popular varieties, obscure varieties, we've got them. High alcohol, low alcohol, no problem we've got them. Literally, no matter what you want in wine you can find it in the Northwest. What is their excuse? I have no problem with European wines just don't pretend to be a farm-to-table restaurant if they dominate your wine list. Italian and French restaurants feel they need to sell wines from those countries, but little or none of the products they use to cook come from Europe - they come from here and for good reason. I understand that if you’re an Italian restaurant you feel the need to have a decent Italian wine list as part of your motif. After it all it makes you seem more authentically Italian. Yet the very essence of the best Italian cooking is based on quality local ingredients. In a country not much larger than Oregon itself, cuisine changes dramatically with a drive of a few hundred miles. When dining in Piemonte the wine selection from Toscana is going to be pathetic at best - and vice versa when you’re having dinner in Siena. No matter if you’re a French, Italian or Spanish restaurant in the Northwest, there is a wide range of local wines that will match perfectly with any dish that you are cooking - with your exclusively local farm-to-table ingredients. Wine comes from farms too. I love farm-to-table restaurants, but I think it’s time for a table-to-farm movement for wine buyers in the Northwest. The chefs are out with the farmers and fishermen, but sommeliers need to get out with the winegrowers. 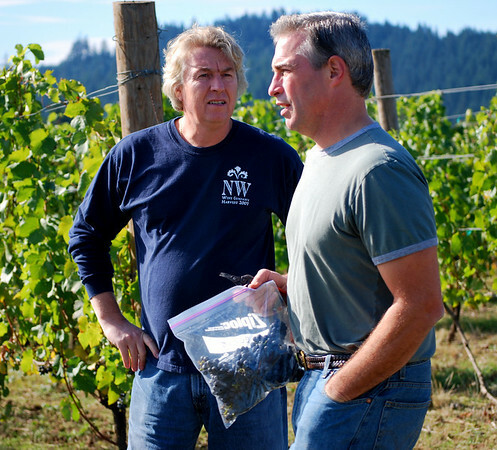 The wines of the Northwest should be treated with the same respect on a wine list that local produce gets on the menu. The closer the farm and vineyard are to my table the happier I am. In the United States we tend to think of wines being driven by a single variety. That there is somehow something purer about being made from one type of vine. The varietal vigilantes are always asking, “is this 100%?” Due to the heavy emphasis on varietal labeling they don’t realize is that historically wines made from a single variety were the exception, not the rule. Some of the greatest names in the world of wine: Bordeaux, Châteauneuf du Pape, Côte Rôtie, Chianti, Rioja, Porto and Champagne are, and have always been blends of varieties. There are classic marriages like: cabernet sauvignon, cabernet franc and merlot; marsanne and roussanne, syrah and viognier that have defined their wine regions. Without a doubt there are great mono-variety wines like Burgundy and Barolo, but many a classic wine region discovered over the centuries that blending produced not only the best wines for them, but a more consistently good wine vintage-to-vintage. I believe that the Applegate Valley is one of those regions where blending creates the most complete and complex wines. In almost all of our wines at Troon Vineyard you’ll find more than one variety in the blend. We think deeply in making these choices looking for varieties that together create wines with greater nuance and personality than they could on their own. My goal in blending is to make the wines come alive and to craft wines that could only come from the Applegate Valley as making a wine of place is at the center of everything for me. Blending is one thing, but I believe you need to go farther and actually co-ferment the varieties that you believe make will make your best blends. When you blend finished wines you can make wonderful wines, but when you can ferment the different varieties together they meld in a new an magical way that simple blending cannot reproduced. When fermenting together Mother Nature’s natural chemistry is amplified and a whole new wine emerges from the fermenter. 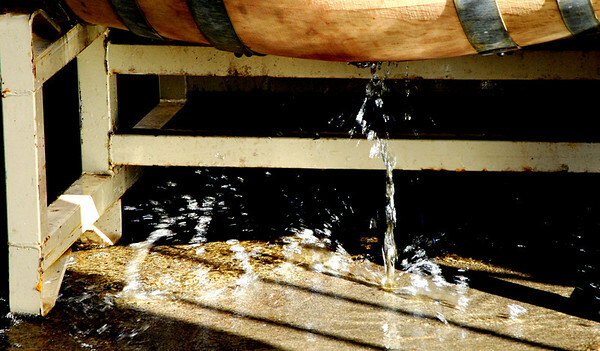 When co-ferments are combined with natural yeasts and natural malolactic fermentations a unique purity of place and variety is expressed in your wine. One of the better examples of this magic is our Troon Vineyard Longue Carabine, conceived by winemaker Steve Hall, which is created by blending several different co-fermented lots. The characteristics of each variety in the 2014 blend (38.5% vermentino, 33% viognier, 33% marsanne, 1.5% roussanne) shows their distinctive highlights in the expansive aromatics and rich texture. Longue Carabine is a one-of-a-kind wine totally unique to the Applegate Valley, Troon Vineyard and Oregon. Being able to create wines like this is one of the inspirations that led me from Napa to the Applegate Valley in southern Oregon. The freedom to constantly experiment and push your wines forward is truly exciting - and truly fun! Firsts are always hard and hard this one certainly was, which always makes the experience even more delicious. In this case it also makes the wine more delicious. This September we’ll be able to share this experience with you. It was with a surprising sense of satisfaction that I picked up the first bottle off the bottling line. It was, of all things a chardonnay. I confess I have little affection for most renditions of this variety in the New World. However, winemaker Tony Rynders changed my mind and I am sure this chardonnay will change yours. The hard part I was referring to in this wine was a backbone. A concentrated minerality and racy acidity that will hurt the teeth of those that love oaky, sweet chardonnay. That is the way I decided to make it. I would never dream of making a spineless chardonnay. Cornerstone has never been about spineless wines and I have no place for them at my table. So this September I will be extremely proud to introduce you to the 2010 Cornerstone Oregon, Willamette Valley Chardonnay. Less than two hundred cases were produced. It’s a lean, mean machine and I wish I could wait another year to release it as it certainly needs a few years in the bottle to show all has to give. I can only hope that some of you will lay some bottles away in your cellar. How did it get here? Well, first of all there was a challenging vintage to deal with, but that’s something winegrowers in places like Oregon and Burgundy deal with seven vintages out of ten. There was a lot of mold when the fruit came in, but we hand-sorted like madmen and delivered only the clean bunches to the fermenter. Starting the fermentation in stainless steel tanks, the wine was racked into mature French Oak barrels to continue and finish fermentation. Those barrels were home to our chardonnay for the next fourteen months where it mellowed and broadened its flavors and, most of all, its complexity. Only 80% of the wine went through malolatic to preserve its perfect tightrope of acidity. In fact, nothing in the cellar was allowed to pilfer anything from the wine. In a strange twist of conventional wisdom, our Cornerstone Oregon, Willamette Valley Chardonnay is a better oyster wine than our Cornerstone Cellars Napa Valley Sauvignon Blanc, which finds its soul mates in crab and lobster. What these two white wines have in common is they will both age beautifully. This is our goal. To let each wine express its true spirit and find the match at your table that nature intended. That nature is something you’ll find subtly expressed in all our vintages after 2008. This is just a start as we will push ourselves each vintage to ever higher expressions of vineyard, variety and vintage. I believe that the Napa Valley is a perfect place to grow sauvignon blanc and that the Willamette Valley is a perfect place to grow chardonnay. Our vision is to go where the variety loves to be, not to force the variety to love where we put down roots. After all, nothing is more important to a wine than the soil that gave life to the vines. That essence flows from the soil through the roots to be mixed with sunshine to create wine. To understand my hesitance to make a chardonnay you have to understand my background. In the early eighties I was importing the wines of Domaine Comtes Lafon through Becky Wasserman, who I represented in the mid-west. At that time Dominque Lafon had yet to take over the estate from his father and was working for Becky. Over a two year period, on his many visits to Chicago and mine to Burgundy, I was privileged to drink a lot of great chardonnay (and a lot of other things) with Dominque. It is on this foundation my viewpoint on chardonnay is based. As a side note, just to highlight how different the wine world is today, in those days we had winemaker dinners promoting the wines of Comtes Lafon, which actually included their Le Montrachet. Times have changed, now you’re lucky and a lot poorer if you can get an allocation of Lafon. The point is, if your early reference point is Lafon Le Montrachet your future enjoyment of chardonnay may be impaired. Certainly I am not trying to compare our Cornerstone Oregon, Willamette Valley Chardonnay to Lafon Le Montrachet, but I will say that if you love Premier Cru Chablis you will pleased by our 2010 Cornerstone Oregon, Willamette Valley Chardonnay. The reason I can say that with confidence is that I am pleased, which is something not easy to do. I’m pleased to introduce you to something new from Cornerstone: Cornerstone Oregon, Willamette Valley Chardonnay. See you in September. We're sometimes marionettes when it comes to food and wine matching, but Love Puppets and skate can cut those strings. Skate wing is one of my favorite fish dishes and meaty, rich fish like this sometimes go better with red than white wines. Especially the way I cooked it, quickly floured and sauteed, then served with a beurre rouge - in this case accented with some pancetta and capers. Easy and delicious. What better to go with skate wing and a red wine sauce than Love Puppets. The Love Puppets here (I'm not sure what you were thinking of) is a lovely Oregon pinot noir from Brandborg Vineyards. The 2006 Brandborg Vineyards Love Puppets Pinot Noir catches all the romance that is pinot noir. Very spicy, brightly fruity and charming, but with just a touch of the earthy, wild mushrooms notes that always highlight the best pinots this is a wine you can drink now or over the next several years. The San Francisco Chronicle placed it in their top 100 wines of 2008 and I can see why. Besides that, it's a bargain at only $30. The real love puppets are the husband and wife team of Terry and Sue Brandborg who make this excellent pinot and a host of other wines from cool climate varieties in their decidedly very cool climate in the the Umpqua Valley in southern Oregon, which they are so successfully pioneering. All to often we seek romance in winemaking, but rarely find it in these days of corporate wine factories, but the Brandborgs are the real thing and you can taste their passion for both wine and each other in the wonderful wines of Brandborg Vineyards. The growing sense of optimism over the 2008 vintage in Oregon has spilled over the edge of the fermenter into outright excitement. 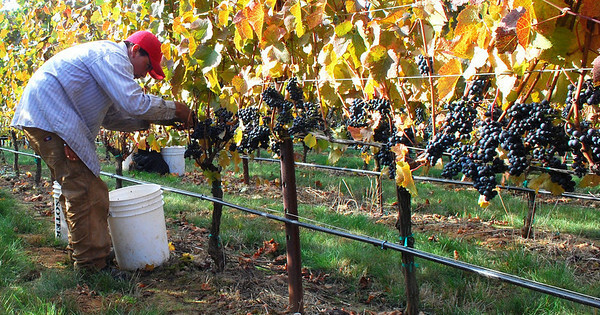 Veteran winemakers throughout the Willamette Valley are letting their enthusiasm for this vintage show now that almost all their fruit is harvested. 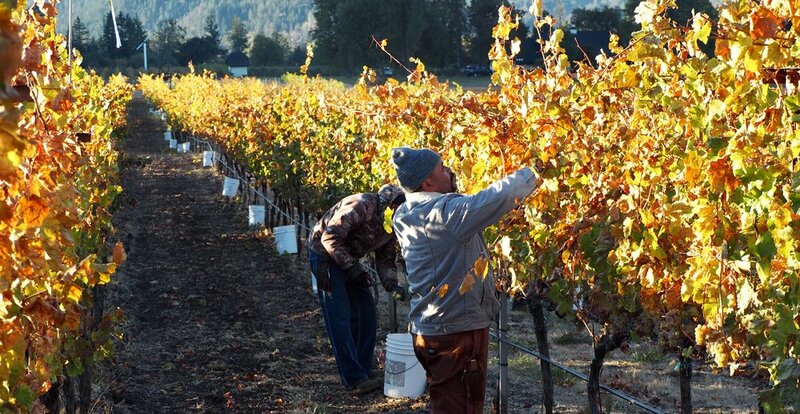 Here are some comments on the 2008 vintage from some of Oregon’s most important winemakers. 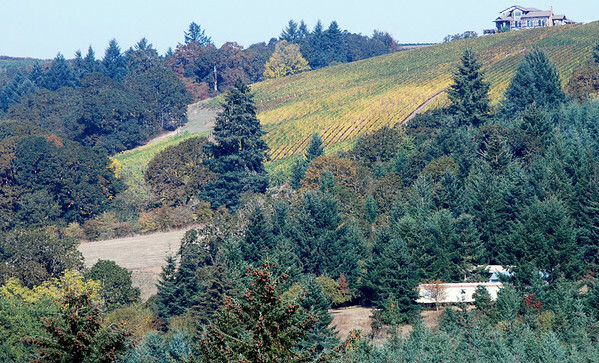 Experienced Oregon winemakers are quietly enthused about the potential of the 2008 vintage. Winemakers are rightfully conservative in their assessment of a vintage at this point in time because you never really can be sure about the quality of a wine until it’s actually wine. However, with experience winemakers obviously develop a pretty good idea of what to expect. Those expectations are starting to sound quite high for 2008. You are hearing similar comments from winemakers throughout the Willamette Valley. The potential is there for a very special vintage in the classic Oregon style, which emphasizes balance, structure, aromatics and elegance with moderate alcohol levels. I’m looking forward to drinking these wines. 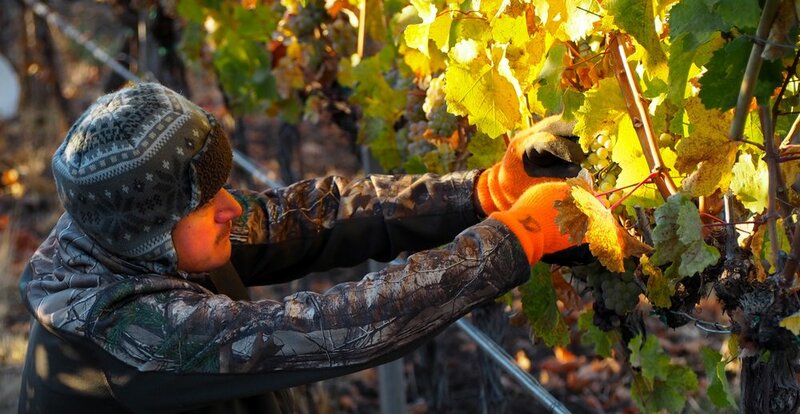 Pictured below, a picker in Tony Soter’s Mineral Springs Vineyard.